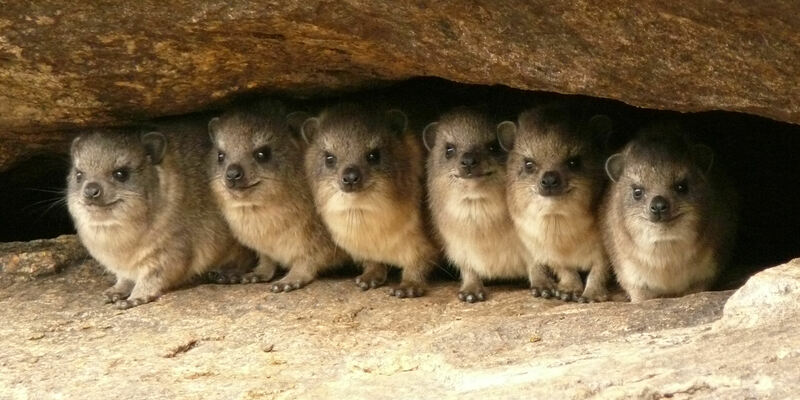 Today I want to write about a cute little animal that has unusually large relatives, the rock hyrax. These cute little guys grow up to 50 cm long. Rock hyraxes look like rodents, but are actually closely related to elephants and manatees. They live in small groups made up of a dominant male, a few females and their babies. They have glands on their back that they use to mark their territory with a smelly secretion. They often have sentries that look out for predators such as eagles, snakes, wolves, leopards and caracals. They are not very good at regulating their temperature, so at the start of the day, they often bask in the sun for a while. When they are warm, they forage up to 50 metres away from their base, looking for grass, fruit, roots and berries. Rock hyraxes are quite common and can be found in rocky areas throughout Africa and the Middle East. Are there any other interesting facts that you would like to share about rock hyraxes? The Rock Hyraxe also known as the Rock Badger, is one of only 3 animals that the Bible states (Deuteronomy ; 14-7) chews it’s cud but does not have a split hood. Even though the bible was given over 3300 years ago and countless animals have been discovered since , these are the only 3 animals found in the world that chew their cud and do not have a split hoof .